It has been an odd time in capital markets: on one hand rising rates, a surging dollar, and a 4 year highs in oil have wreaked havoc on Emerging Markets, and may soon spill over to developed markets although so far US stocks have been resilient, if failing to break out of the recent range despite the small-cap Russell 2000 hitting new all time high. 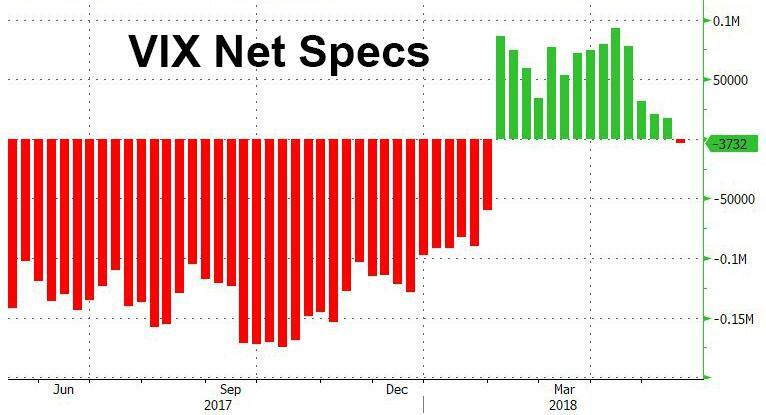 At the same time, a financial publication used several hundred words to not so simply say that there was $8.8bn in equity inflows into US stocks even as the S&P had its biggest weekly drop in over a month; meanwhile the VIX has been grinding lower despite Italian populist forces forming a government in Europe's 3rd largest economy, with VIX net specs turning negative for the first time since the February VIXplosion as vol selling is all the rage again. The answer is simple: the second quarter has been one giant short squeeze. As has so often been the case, following the violent market moves in February and then again in late March, hedge funds reloaded on shorts and sector ETFs. 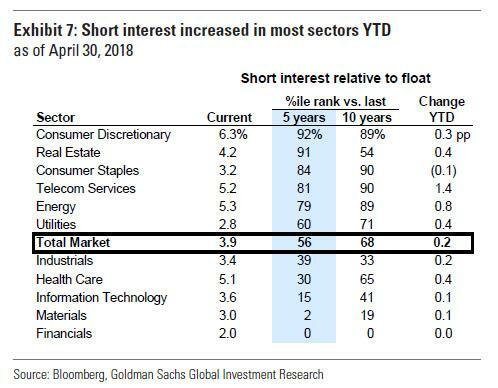 According to Goldman's Ben Snider, YTD, stocks in all sectors but Consumer Staples have seen a rise in short interest as a share of float. Hedge fund net short positions have also increased in most sector ETFs, while Goldman's Very Important Short basket, containing S&P 500 stocks outside of the VIP list with the largest notional value of short interest, has underperformed the S&P 500 by 180 bp YTD (0.7% vs. 2.6%). 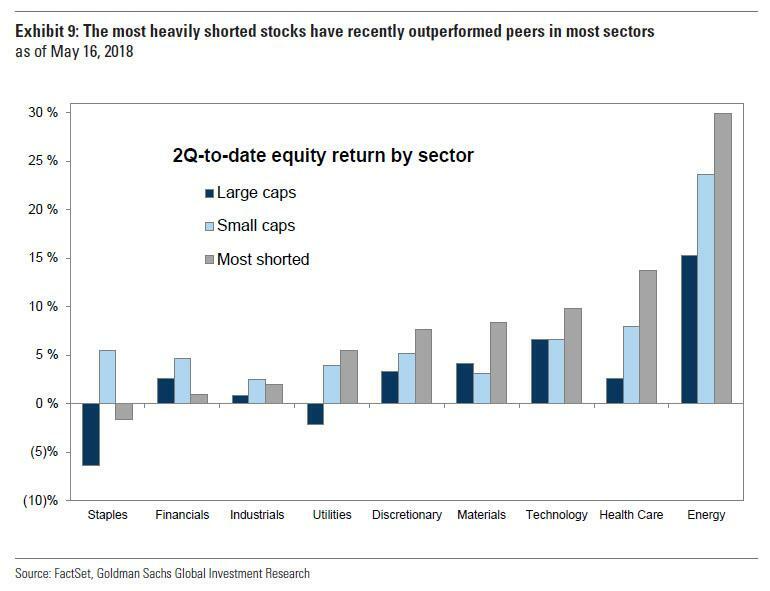 Then things changed in the last two months, or since the start of Q2, when as Goldman's prime desk reports funds aggressively covered the most crowded short positions. In fact, as the chart below shows, stocks with the highest short interest relative to float have outperformed their peers in most sectors. The outperformance has been particularly dramatic in the Energy sector, which experienced a large increase in hedge fund net positioning during 1Q and has been the best-performing equity sector thus far in 2Q. 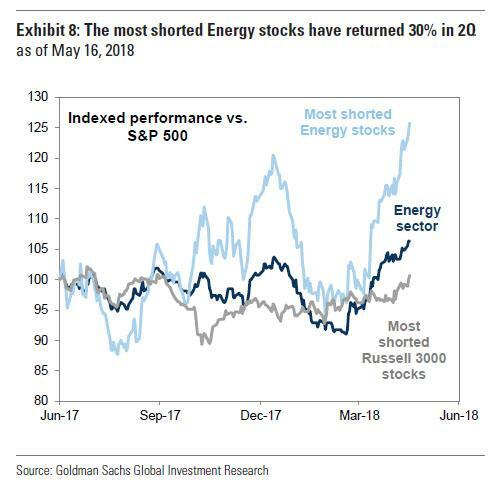 And the punchline: since the start of 2Q, large-cap Energy stocks have returned 15%, small-cap Energy stocks have returned 24%, and the most heavily shorted Energy stocks have returned 30%. In short: the biggest outperformers this quarter were those "most hated" names that saw the biggest short squeeze, a strategy that has been a guaranteed generator of alpha since 2012 when we first recommended going long a basket of the most shorted names. It's not just single stocks and ETFs that saw another short wipeout. As Goldman also observes, while hedge funds kept their net and gross exposures elevated, futures exposures have fallen sharply YTD. Leveraged fund US equity futures long and short positions have each declined, however as abnove, shorts have fallen materially more than longs. 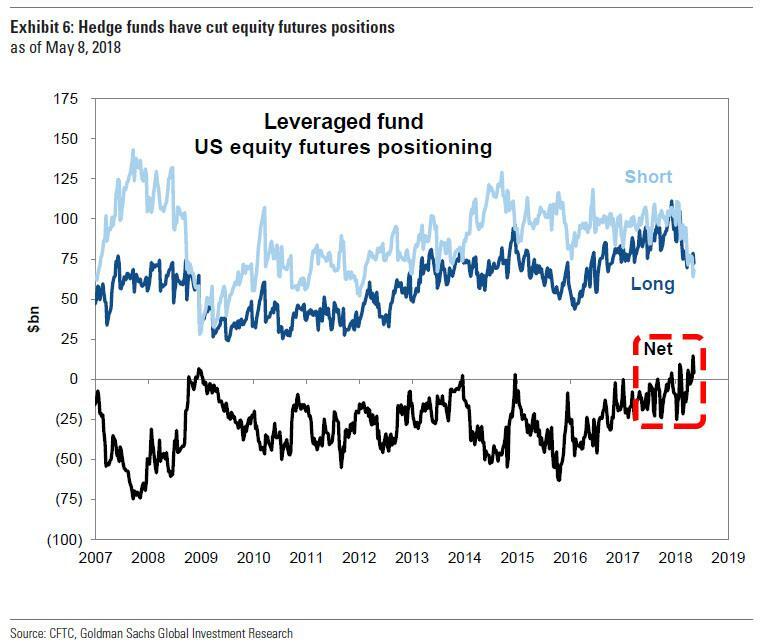 Goldman concludes that "this is the first time since the start of 2009 that leveraged funds have had a substantial net long position in US equity futures." Or said otherwise, that there are now far fewer shorts left to squeeze and cushion the market during the next sharp move lower.